… has been a little rocky, and we haven’t even left Medford yet. Andreas and I went to an international teaching jobs fair in San Francisco in February. 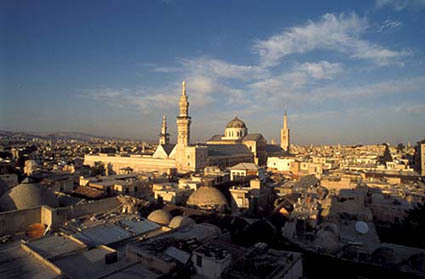 We came away thrilled to have accepted positions at an American school in the oldest continuously inhabited city in the world: Damascus, Syria. Sure, there was trouble in Egypt and some other neighboring countries, but Syria was a model of stability in the region. We assured our nervous friends and family that Syria was as safe as houses. By the third week in March, when we were in southern California for our annual visit with Andreas’s family, my brother-in-law George was delivering LA Times news clippings about Syrian protests every morning with our eggs and toast. Thanks, brother, we said with a smile. It’s just a blip on the screen. Where we’ll be headed in August. But then that blip got bigger, and we flinched. We pursued a possibility in Bangkok, but to make a long story short, in the end Thailand didn’t feel right for us. Perversely, Damascus still does. So we’re on. As long as the school is planning to open, we plan to be there. This entry was posted in Background, Expat experience, Teaching and tagged job search. Bookmark the permalink. Say, this sound like my story. Only in my story there were kids involved. International intrigue, a shaman from New Mexico spouting aphorism about prickly pears and gummy bears. Hmm, now that I think about it, I feel like my narrative is sufficiently different not to compare to yours.